Behavioral Interventions--For Kids! : Stomp, Stomp, Stomp Away! I am pretty proud of my clients in general, but this time I am going to brag about what this kiddo came up with. I took over this client from another PSR, who came up with the idea to use paper hand prints to use as a reminder of wall push-ups, making this coping skill more appealing. Soooo, he came up with the idea of using the same concept to help him use stomping as a reminder to stomp away his angries. 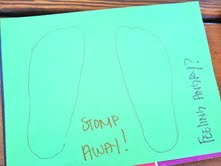 Very simply, we traced his feet to make the stomp pad. Then he decorated it, giving himself a reminder to put up at his house.